When you need any form of service or repair for your car, don’t hesitate — call TransMedics, Raleigh, NC’s local leader in the automotive business. Whether you’re an individual car owner who needs work on your family’s SUV or the owner of a fleet of vehicles in need of a service provider you can trust, the professional and experienced mechanics at TransMedics are here to help! Locally-Owned & Operated – Ever visited a national chain location for automotive service and felt you weren’t a top priority? TransMedics owners and staff members are local and proud members of the community. We’ll treat you and your vehicle with the respect you deserve each and every time. Experienced – Owner and operator Scott Sheets has been in the transmission and auto business for more than 30 years. Additionally, our mechanics have decades of combined experience in the industry, making us one of the more seasoned automotive teams in the Triangle. Proud to Provide Complete Automotive Service – Our experience lends itself to a unique ability to perform a wide variety of car repairs and services, including transmissions, tires, brakes and more. At every turn, we pride ourselves on providing great customer service and a job done right — all at a fair price. Schedule an appointment today to reserve a spot for service or bring your car in for a free estimate. As always, we look forward to serving you. 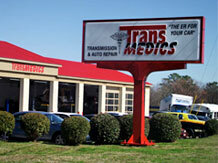 TransMedics’ customers drive from all over our area to visit our auto shop in Raleigh. We routinely assist car owners from Wake Forest, Rolesville, Knightdale, Durham, Cary and beyond. $20 off Any Auto Repair Service Minimum of $500. Limited time only. © 2019 Transmedics. All rights reserved. Internet Marketing and Web Design by Click Optimize, LLC.